I don’t know about you, but I REMEMBER getting the chickenpox as a young child. It was itchy and awful. And oatmeal baths! Oh, the oatmeal baths!! 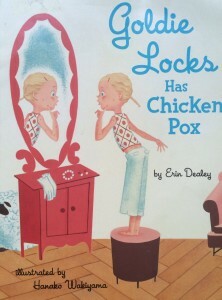 Because this is most often a children’s disease, I thought it would be appropriate to litter this post with the some of the cute photos from one of my daughter’s favorite children’s books: Goldie Locks has Chicken Pox by Erin Dealey, illustrated by Hanako Wakiyama. 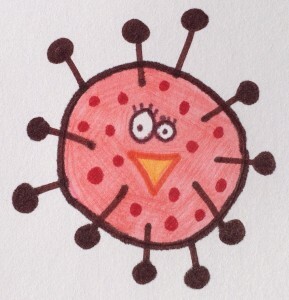 Chickenpox is caused by a virus called the varicella-zoster virus (VZV), which is part of the herpesvirus family. The same virus that causes chickenpox can cause shingles later in life. The virus is called varicella when it causes chickenpox, then the virus hides in your body and it gets called zoster when it flares back up and causes shingles. There is also a vaccine for shingles called the zoster vaccine, which you may get should you choose to at around the age of 65 (but, that’s for another post).